Pécs (German: Fünfkirchen, Croatian: Pečuh) is a city with 150.000 inhabitants in the south of Hungary. Since 1009, it is the Bishop’s seat. As early as the 13th century, the city had a German population and several of Pécs’ bishops in the Middle Ages came from German speaking areas. One of them was Wilhelmus, who initiated the country’s first university in 1367. The city came under Ottoman rule in July 1543. As the name of the last Christian judge before the invasion – Wolfgang Schreiber – shows, German citizens had held leading positions at the time. Louis, Margrave of Baden and the Imerpial Austrian troops took over Pécs and the region up to the Drova in 1686. The 18th century was shaped by an effort to re-build Pécs. The area was then mostly settled by families from Germany and Austria. Pécs became a Catholic town with different nationalities. Apart from Germans, Hungarians and Croatians populated the city. 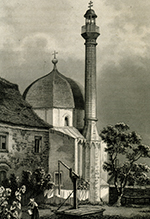 In the city centre, on the Calvary and in the southern parts of the town German was the predominant language, Croatian in the eastern parts and Hungarian in the west. In the mid-19th century, the Danube Steamboat Shipping Company (Donau-Dampfschiffahrts-Gesellschaft) was established, which was interested in the coal mining in the mountains of Mecsek. As their route went through Pécs, the city saw an economic boom with German and Austrian architects coming to work here. Thus, those buildings – private and public – which still shape the cityscape today were built at that time. In the 1930s, a German theatre was founded which remained open until 1865. After several German newspapers had been published only temporarily, the “Fünfkircher Zeitung” (Pécs Newspaper) was founded in 1870; it was a patriotic and liberal paper with many of the writers and editors being part of the local Jewish community. The city became the centre for German education in the south of Transdanubia in the second half of the 20th century. The local teacher training college offered its first course for German teachers in 1957 and in 1994, a Hungarian-German education centre was founded, which was named after the poet Valeria Koch in 2005.From the 1950s onwards, German radio programmes were produced in Pécs and an editorial team for television programmes started work in 1972. In 1985, the first civil organisation of Germans of Hungary after World War II was founded: the cultural association Nikolaus Lenau. In 2010, Pécs was, in association with Essen and Istanbul, listed as European Capital of Culture. Lenau House offers various cultural events and temporary exhibitions. Furthermore, guestrooms are available. 7621 Pécs, Munkácsy M. Str. 8. 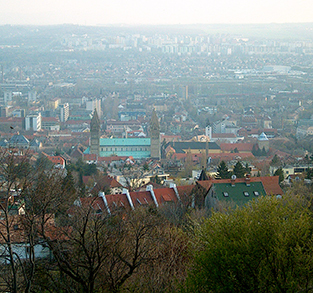 View of the city from Mount Mecsek. 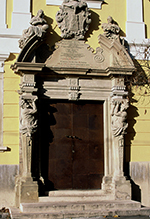 LEFT: Baroque porch of the comitat‘s former administration building. RIGHT: Mosque of pasha Jakowali Hassan, built in the second half of the 16th century.